நண்பர்கள் பேராசியர் வ.வேசுவும் சுப்பு மணியனும் மாதந்தோறும் நடத்தும் “தமிழ் வளர்த்த சான்றோர்” கூட்டங்களைப்பற்றிய கட்டுரை 14/08/15 ஹிந்துவில் வெளியாகியிருக்கிறது. Sri Krishna Gana Sabha’s initiative turns the spotlight on people’s contribution to Tamil, writes Suganthy Krishnamachari. 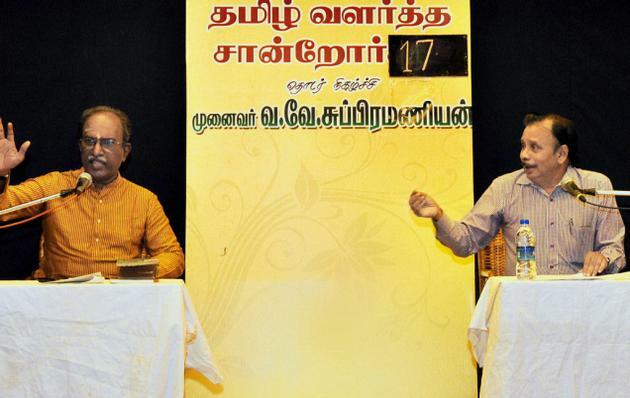 ‘Tamizh Valartha Sandror’ is an onstage conversation about the contributions of various people to Tamil. The programme is the brain child of Subbu, organiser of Tamil Nadu Vasagar Vattam, and Va. Ve. Su. (Dr. V.V. Subramanian), a retired Professor of Plant Biology, who has an abiding interest in Tamil.The programme has no sponsors and is entirely supported by Sri Krishna Gana Sabha. It has drawn people of different age groups, and the shows have always been houseful, even during the IPL matches!“There is this wrong idea that love for Tamil somehow precludes belief in Hinduism. But few could have handled Tamil the way Kripanandavariar did, and yet his lectures were about religion. So we’ve included the contributions of people like Variar too,” says Subbu.“Contributions of U.Ve. Swaminatha Iyer, Papanasam Sivan, Pammal Sambanda Mudaliar and so on have been discussed, the idea being to highlight contributions to Iyal, Isai and Natakam, nationalistic causes and religion,” says Va.Ve.Su. The programme has been a journey of discovery, for the audience and the organisers. For example, in the segment on P. Sri, popular writer in Ananda Vikatan, it came to light that when P. Sri heard his grandson Sudhangan sing ‘Kallellam Manikka’, he called up Kannadasan to compliment him on writing a film song about Kalidasa and Kamban that became popular among youngsters. Half an hour later, Kannadasan turned up at P. Sri’s house to seek his blessings! Nityashri Mahadevan mentioned a song whose composer DKP had forgotten. When this was reported inKalki, linguist Siddhalingaiah wrote in to say that the composer was his grandfather, Ramalingaiah!A.P. Nagarajan (APN) had not been to school, as he had joined TKS’s troupe at the age of nine. And yet he wrote the script for the film, ‘Sampoorna Ramayanam,’ when he was just 28!“APN gave roles to his friends from theatre, for instance as Balaiah’s disciples in ‘Tiruvilaiyadal Puranam.’ A younger artist was suggested instead of Padmini for ‘Thillana Mohanambal,’ but APN turned down the suggestion,” said ARS.The possible subjects of discussion seem endless, and it looks like no one, not even the organisers, can guess which will be the concluding episode! ***The 17th episode of Tamizh Valartha Sandror was on A.K. Chettiar (AKC), and saw Va.Ve.Su. in conversation with writer Ramanan.AKC produced the first Tamil documentary on Gandhiji. He collected material from various sources, and also shot at the Sabarmati ashram. He shot a scene of 2000 women spinning charkas in Tiruppur, where the background song was Namakkal Kavignar’s ‘Aadu Ratte’ sung by DKP.This writer has heard the 78 rpm record of ‘Aadu Ratte,’ produced by Columbia Records, played on her father’s gramophone; on the other side of the disc is another song from the same film: ‘Naam Gandhijiyai Ninaippome; nal kadar udaiyai anivome.’ The music was by S.V. Venkatraman. The disc was not mentioned in the programme. Va.Ve. Su later told this writer, that he didn’t know that a record had been cut, and that he would include the information in a forthcoming book on Tamizh Valartha Sandror.In the book, ‘Annal Adicuvattil,’ AKC recorded his experiences of making the film. He writes of a porter at a railway station who refused to accept payment from AKC, because he was producing a film on Gandhiji.AKC paid Congress leader Satyamurthi Rs. 800 for lending his voice for the dubbing, instead of the Rs.1000 that Satyamurthi wanted. AKC records in his book that he was saddened because Satyamurthi did not speak a word to him during the train journey to Bombay.The film was first released in Roxy theatre, Purasawalkam, on August 23, 1940. Twelve years later, the documentary was dubbed into English and the day Eisenhower was sworn in as the President of United States, he and his wife watched the English version.AKC ran a magazine called Kumuda Malar. The British Government was wary of granting registration to magazines, so he overcame the problem cleverly. He didn’t call it a magazine, but merely numbered the issues so they could pass off as volumes of a book. Although, readers knew it was a magazine. When Tiruppur Krishnan wanted to subscribe to the magazine, AKC told him that someone on the street where Krishnan lived was already a subscriber and that he (AKC) would tell that subscriber to lend his copy to Krishnan!AKC wrote many books based on his travels. In his book on Kodagu, he quotes a correspondent who said that Rajaji would be glad if the Cauvery river flowed as coffee!AKC also compiled a collection of travel essays, which included those from 1874 and 1885, two essays by Chellamma Bharati, wife of poet Bharati, and Tiru.Vi.Ka’s essay on train travel by third class titled, ‘Bhooloka Narakam.’Next programme: August 17, 6.30 p.m., at Sri Krishna Gana Sabha: Madurai G.S. Mani talks about his association with M.S. Viswanathan.